Your happily ever after starts here! 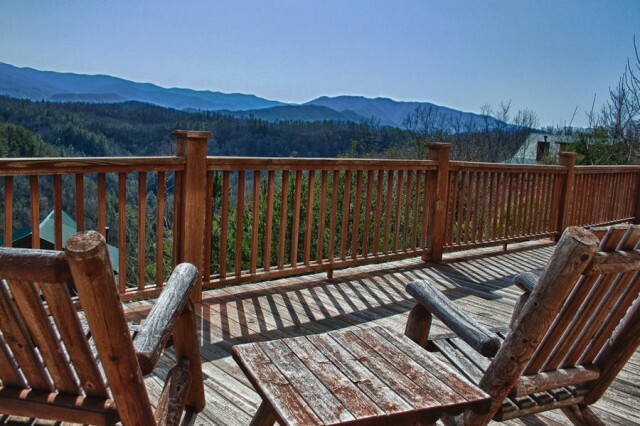 Endless View offers a storybook-worthy setting in the beautiful mountains of East Tennessee. Great Cabins in the Smokies features this Wears Valley, TN, cabin and several more Wears Valley cabin rentals to choose from! Endless View is certainly a noteworthy three level log home you will want to consider for your next special occasion – a honeymoon, anniversary or special event. It’s big enough for private moments for you and your group, if you choose to bring one along. You will be in awe of the gorgeous views of Wears Valley you will enjoy, thanks to the large wall of windows on display in the huge living area. Take in the views and enjoy some quality adult time on the spacious wrap around deck while the children find ample entertainment in the large game room downstairs. The hot tub is also accessible from downstairs and is the perfect place to relax away the day. With bathrooms and bedrooms on the two upper levels there is plenty of room downstairs for the night owls to still have a great time if others choose to call it a day. The spacious bedrooms feature plush furnishings that offer a comfortable, home-like atmosphere, with plenty of space for you to spread out and truly make yourself feel right at home. Tie the mountain memories together over a nice meal from the comfort of your cabin while looking out at the breathtaking Smoky Mountains. While you’re nestled right between historic Townsend and Wears Valley, this convenient location will allow you to access the scenic adventures that await! During your stay, be sure to get out and explore the wide array of trails (varying in skill level) in nearby Great Smoky Mountains National Park, or discover the thrilling attractions available for all ages in Gatlinburg and Pigeon Forge. Call today to make this Wears Valley, TN, cabin yours for your next special occasion, family getaway, or gathering with friends! No matter the occasion, this luxurious cabin in the Smokies offers everything you need for a memorable mountain vacation. Conveniently reserve this cabin or any of our other Wears Valley cabin rentals with just a few clicks on our website or contact us at (866) 409-7066 if you would like assistance with your planning process.